I’m not a train person in general. Not in the sense that I have any feeling for the ‘romance of steam’ or the beauty of the engines. I’m the wrong gender to feel any urge to catalogue their numbers, or to build model railways in my attic or garden. Trains, like cars, and planes and buses are just ways of getting where you want to go. In general. 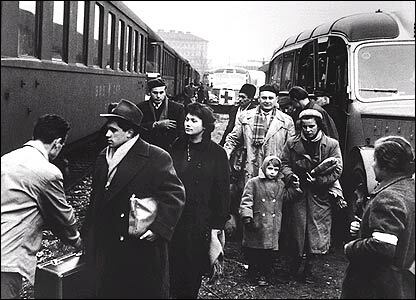 But in the context of the stories I’ve been posting and reading and thinking about during Refugee Week, trains have a powerful, poignant, terrible significance. I’ve stolen my title from Steve Reich, whose composition of that name explored the journeys that he had made and that he might have made during the war years, using recorded speech from Holocaust survivors, amongst others. The railway station is a heterotopic space, holding together both the actual location and the destinations with which it connects. And so Liverpool Street Station for W G Sebald’s Jacques Austerlitz connected him with his own past, as the small boy who had arrived from Prague with the Kindertransport, and with the station on which he’d said goodbye to his mother, clutching a small suitcase and a rucksack with food in it. 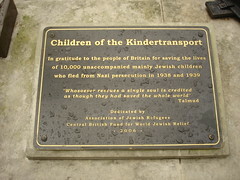 Indirectly it connected him with the station at which his mother was herded onto a cattle truck and taken off to Terezin. His name recalls the Gare d’Austerlitz in Paris, where Francois Mauriac describes children being dragged from their mothers and pushed onto the trains, one sombre morning. Not long after, on another continent, trains crammed with refugees from India to Pakistan, or from Pakistan to India, after Partition, were ambushed and their passengers massacred. The dramatisation of those events in The Jewel in the Crown still haunts me. Perhaps because on another continent, twenty years later, a train commissioned by an expat who worked for the Nigerian railways to take Igbo refugees south, was ambushed, and its passengers massacred. Among them were the people who my father had found hiding in an abandoned house opposite our own, in Zaria, and taken to the army compound in the back of his car, covered with blankets, hoping they would find safety. Chimamanda Ngozi Adichie, in her wonderful novel Half of a Yellow Sun, describes the arrival of another train full of refugees that did reach safety, but traumatised, mentally and physically. I think sometimes of a children’s book by Susan Cooper, who can conjure up a terrifying sense of evil, enough to chill adult bones – it’s part of her The Dark is Rising series, but I can’t recall which – in which the rhythms of the train say ‘into the dark, into the dark, into the dark…’ Hard to get that out of one’s head, once it’s been introduced. And I think of it every time I read the accounts of those trains crossing Europe, heading East, to ‘work camps’, to Pitchipoi, into the dark. And perhaps most hauntingly, of ‘le train fantome’. In the summer of 1944, as the Allies were advancing across Europe, with Paris liberated, the convoys were still rolling. But not all of the trains took their passengers into the dark. This photograph captures an extraordinary moment. The 743rd tank battalion encountered a group of civilians, skeletally thin, terrified. They had been en route to another camp, but abandoned by their SS guards – at this moment they understood that they were free. And at railway stations in England, in 1939, and so many years since, the trains have brought people into hope and life and freedom. They brought with them not just the belongings that they had managed to salvage and to hold on to on the journey but the places they had lived, and the lives they had to abandon, and the memories that would shape them. When I was 9 years old, my family lived in Zaria, in Northern Nigeria. It was 1966, and a series of coups d’etat were hiking up tensions between the north and south, tensions which in May and September of that year resulted in mobs seeking out and killing on the streets, in the schools and hospitals and churches, anyone recognised as being of Igbo origin. I don’t know how many died. Probably no one does. Because of the civil war that followed, the pogroms in the north have received little attention – though Chimamanda Ngozi Adichie in her stunning novel Half of a Yellow Sun portrayed these events incredibly powerfully. I was a child, and my parents protected me and my younger siblings from the horror of what was happening. But even as a child I heard and saw enough – even when the adult conversations stopped abruptly in my presence – to be haunted by what I’d half overheard, seen out of the corner of my eye. I’ve needed to try to understand what happened, not just in Northern Nigeria in 1966, but whenever an attempt is made to wipe a group of people from the face of the earth. We’re told that we must remember the past in order not to relive it. It’s a lot more complicated than that of course. In order not to relive it we’d have to understand it. Memories aren’t necessarily trustworthy – after the Liberation, Michel Butor has spoken of how his parent’s generation said of the years of occupation, 1939-1945 was a nightmare, but it’s over, so we’ll forget all of that and pick up where we left off. His generation of writers has been preoccupied with memory, and how we revisit, rework and reshape as we try to master the past. The simple imperative to remember would seem to have done us little good in the generations since Auschwitz. It didn’t stop, or even slow down, the slaughter in Rwanda, the massacres in Srebenica, decades of pogroms in Nigeria, the devastation in Darfur, the killings in Cambodia. But remember we must. The important thing is that we remember right, and we remember well. I’m reminded, oddly perhaps in this context, of a song from South Pacific: ‘You’ve got to be taught To hate and fear. You’ve got to be taught from year to year. It’s got to be drummed in your dear little ear. You’ve got to be carefully taught.’ Frances McDormand’s character in Mississippi Burning echoes these words very closely: ‘Hatred isn’t something you’re born with. It gets taught. At school, they said segregation is what’s said in the Bible… At 7 years of age, you get told it enough times, you believe it. You believe the hatred. You live it… you breathe it. You marry it.’ And so we need to teach the opposite, for the sake of the future. And for the sake of the past. The perpetrators of genocide don’t start by taking lives. First they take everything else – name, livelihood, home, dignity, humanity. For it to be possible for society to collude in this, the victims have to become less than human – cockroaches, perhaps, or lice. Or less, even, than that – one of the most powerful Holocaust documents is a memo, addressing technical problems with vehicle stability. As one reads it, it takes a while before the nature of the destabilising ‘load’ becomes apparent: this load has a tendency to rush towards the light, which causes problems in getting the doors closed. This load may also scream. And so, for the sake of the past, we need to give back to the victims of genocide what we can – their names, their stories, their voices. Serge Klarsfeld reconstructed the convoy lists from the French internment camps and gave the people once herded onto cattle trucks a name, an address, sometimes a photograph, a letter. The photographs of the children – see them if you can bear it, and I think one has to bear it – in their best clothes or on summer holidays, looking solemn or smiling for the camera, tell you everything, in a way, about genocide. Sheffield’s wonderful Ensemble 360 performed music last spring by composers who were imprisoned at Terezin – music created in the midst of a nightmare, by composers who had barely begun to achieve their potential before they were silenced. Hélène Berr is one of the people I will be thinking of on Holocaust Memorial Day. 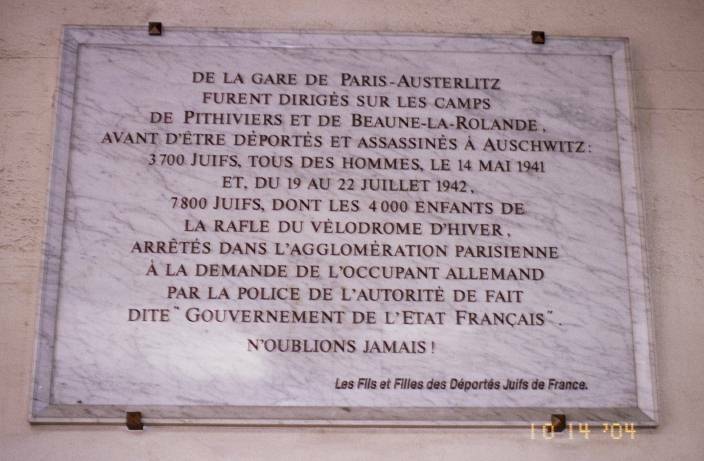 She was 20 when Paris was occupied, from a thoroughly assimilated French Jewish family, a student at the Sorbonne. She was 21 when she started the journal in which, at first, the war and the Nazi persecution are almost background noise. She was almost 23 when she was arrested, a few months before Paris was liberated, and then deported to Auschwitz on one of the convoys from Drancy. It was her 23rd birthday when she was moved from Auschwitz to Bergen Belsen. She was 24 when she died, in Bergen Belsen, 5 days before the camp was liberated. Her journal, kept by surviving members of her family after the war, was finally published in 2008 and when I read it I loved her, and I grieved for the fate I already knew would be hers. Another voice that wasn’t quite silenced, after all.